The popularity of our client’s products presented opportunities for them to expand their market in Australia and overseas. Constrained by space, production capacity, manufacturing systems and processes more suited to a much smaller business, our client recognised the need to improve production and management processes and systems in order to increase productivity, improve customer service and reduce waste – in short become more efficient. Figure 1 – This simple load levelling box controls the scheduling of production, ensuring a level rate of production, providing a visual indication of production progress against scheduling and empowering the teams to control day to day operations, freeing up managers to focus improvement and growth. Branach Manufacturing creates and distributes a world leading range of extension ladders and safety platforms that address many of the workplace safety issues associated with accessing heights. Used extensively in industrial and service environments, Branach also creates ladders and platforms for custom applications. 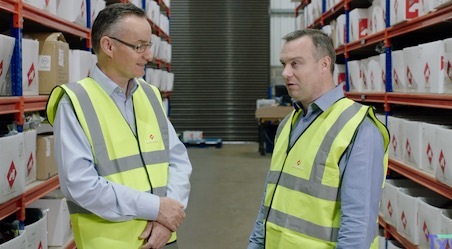 Impressed with a previous working experience with TXM, Branach Managing Director, Mike Walsh approached Tim McLean from TXM looking for a pragmatic and tailored solution. Design of production cells for assembly of ladders and platforms. Establishing a finished goods ‘supermarket’ for platforms. 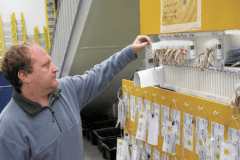 Establishing a system to level production to customer demand. Setting up a system to ‘pull’ ladder profiles and components into the assembly area. Establishing a ‘supermarket’ to manage the re-ordering of raw materials. Implementing P5S and visual management to more effectively track the progress of key metrics. Using structured problem solving and a regular meeting to address persistent shop floor issues. This all added up to a radical cultural change for Branach who adapted to the change enthusiastically. Figure 2 – Use of standardised work in a customised production environment requires special skills and techniques, but can lead to breakthrough improvements in productivity, quality and employee engagement. A 50% overall increase in productivity. A 90% reduction in packaging time. 80% reduction in order lead time for customers for access platforms custom-made extension ladders. Growing the business while retaining low overheads. Most importantly the TXM project has provided Branach with the robust processes and productivity needed to grow their business, and grow they have, achieving a 100% increase sales over the past four years, including growing new export markets. Freed from day to day crisis management, Branach senior managers are now focused on improving their excellent product and developing new local and export markets.